Have you seen the weather report for this week?! Highs in the 70’s will be coming to the Reno/Tahoe area. With this warm weather teasing and tempting us, I am ready for summer and all of the outdoor activities to come! We have been in winter mode and I understand that if you don’t ski, snowboard, snowshoe, or do any other winter sport, chances are the weather keeps most indoors. I personally know that when the weather is warm I will see ten times more people out walking by the river near my work. With this warm weather coming our way I am going to share some great outdoor activities to do in the spring in Reno/Tahoe throughout this semester. When the weather is really warm for spring, you can spend all day outdoors. In the spring there is so much to do in this area; I will describe several activities every couple weeks for you to try! The first one I am going to start with is road biking. This is one of my favorite outdoor activities. It is an awesome sport and such an economical way to get from one place to the other without a motor. As described in my blog about riding around Tahoe biking is also a great way to see your environment in more detail and time than you would in a car. My favorite ride in Reno is the Verdi Loop. It is along paved roads, bike paths, and quiet highway roads that take you outside of Reno to the west. The ride is very popular among riders and you will more than likely ride by several. It is not a super challenging ride, and for those looking to get into the sport it is great because there aren’t any super challenging hills and traffic is minimal. The ride goes out Old Highway 40 out to Verdi and then loops through the neighborhood and back onto the highway into town. Exploring Tahoe on a road bike is one of my favorite things to do. Sometimes I’ll drive up there, park somewhere I haven’t before and just take off and try to find good hills, quiet roads, and awesome views. Aside from riding around the lake, I enjoy riding up the lake side of Mt. Rose. This is a good climb that offers excellent views and a nice wide shoulder to ride on. If looking for something a little less steep, parking in Tahoe City and riding south along the lake on the bike paths can be really fun. This ride is great for groups or for working on speed or your pace on flats. The path runs in and out of trees, along the main roads and has some great lake views. Not to mention there is a general store in Tahoma that has the best deli sandwiches out there! I hope this gives you an idea of some fun rides in the area as well as what it’s like to be on a bike. I love breathing the fresh air in my lungs, flying down the hills, and the feeling of my own strength and endurance propelling me from one place to another thanks to the beautiful invention of a bicycle! What rides to you like to do in the area? Please share! 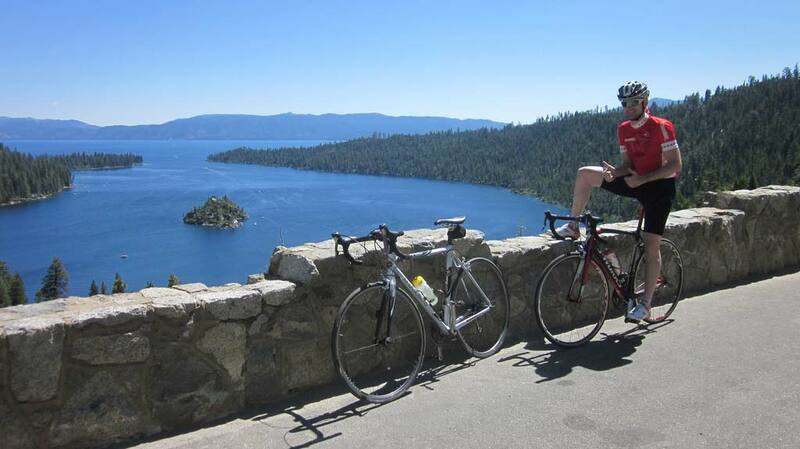 This entry was posted in Uncategorized and tagged Lake Tahoe, Outdoors, Outside, Reno, Road Biking on March 11, 2013 by joshvega.